Just seven miles west of Key West, Sand Key Sanctuary Preservation Area (SPA) is marked by an old red iron lighthouse that was completed in 1853. Originally called “Cayos Arena” (Sand Island) by early Spanish explorers, the shape of Sand Key shifts with the weather. The reef at Sand Key is typical of major lower Keys spur and groove reefs. The spurs are ridges of coral five to 20 feet deep, with grooves of sandy bottom between cliff-like structures. Fire coral abounds in several sections of the reef. The northwest side of the reef has coral heads and mixed rubble in close proximity to the lagoon. The south side of the reef gradually slopes away to a gentle ledge at about 65 feet, dropping to 90 feet in some places. In the shallows are artifacts from the original brick lighthouse, which blew away in an 1846 storm. Visibility at Sand Key can be highly variable, ranging from 15 to 110 feet, depending on the wind, wave action, and monthly tide variations. 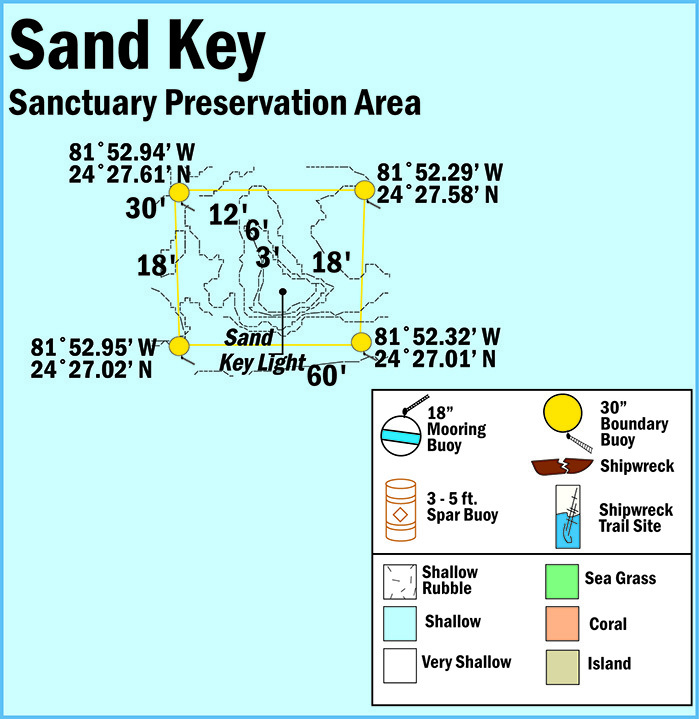 View a map showing the location of mooring buoys within Sand Key Sanctuary Preservation Area.